Sam Smith – On Sunday we had our monthly supper at a community club that once was among our Maine town’s nine one room schoolhouses. 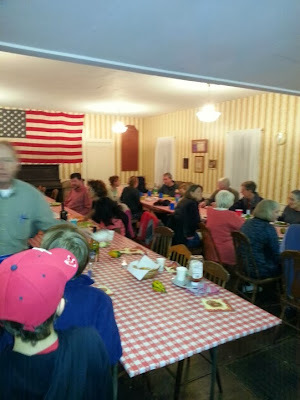 Pot luck, no program, and thirty odd attendees ranging from third graders to the retired. After the supper we sat around and discussed a few matters of mutual import such as choosing new officers, the favored design of an oil cloth table cover replacement, and the best way to cut down on the reverberations in the room. I lived in one neighborhood in Washington that had something similar on a less regular basis, but for the most part the idea of bringing neighbors together for no better reason than to share some meatloaf and desert and chat awhile seems antiquated. In our age of strategic visions and bucket lists who has time just to get to know the people down the road? Yet, since moving to Maine full time, I have been struck by how often the blending of the formal and informal, the purposeful and the social, helps to keep the place friendly, democratic, cooperative, and efficient. It seems, for example, that you can’t do business in Maine without a anecdote or two traded among the participants. But it’s not a time killer; it’s also allowing everyone to get a better idea of whom they’re dealing with. Similarly, farming and fishing, mainstays in the state, are based on a combination of cooperation and competition that an MBA would find hard to comprehend., But it works. Every time I go to one of these potluck suppers, I not only have a pleasant time but I learn something, including more evidence that events don’t have to have much of a purpose to be meaningful.